Better known as "The Face" of the band, "Cat Daddy" Corey is one of the founding members of The Vintage Vandals. His strong vocals, excellent song writing, and his skill and finesse with the guitar give the band its unique sound and style. You can find him cruisin' around town in his '28 Model A sedan with his beautiful wife and Vandal songwriter, Monica. 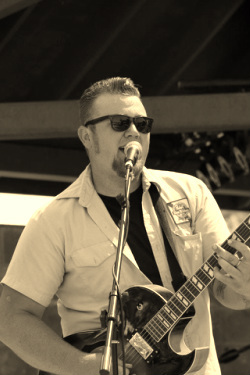 Nick is one of the band's founding members. Slapping the upright bass, Nick tolerates the other band members' teasing while he drives the girls wild with his good looks and cool exterior. And though he is the strong, silent type on stage, he still chimes in with some good backup vocals. With his '64 Ford Ranch Wagon, he carries most of the band's gear to their gigs along with his lovely wife and official Vintage Vandal photographer, Nicole on his right. Veteran drummer Dan J. DeVille bangs on his vintage, Slingerland kit while belting out both lead and backup vocals for the band. His showmanship is truly top notch and he provides about 97% of the band's energy. When he's not doing his thing in front of a crowd, he's busy spending time with his lovely wife, Amanda. 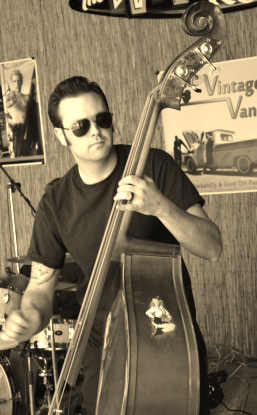 With over 30 years experience performing live music, Dan truly puts the "vintage" in The Vintage Vandals.